Does this post even need words? Just look at that. Well, maybe a few. 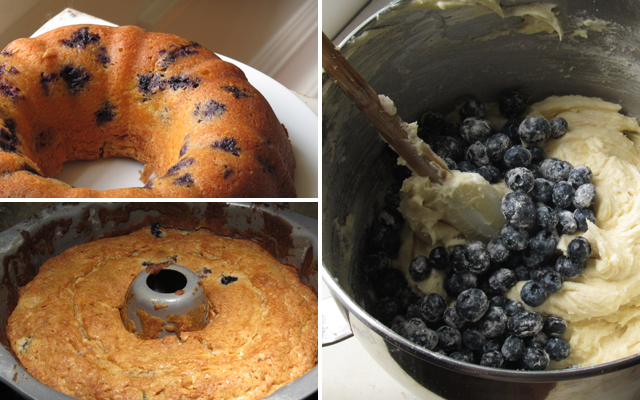 At my friend AJ’s house in New Hampshire a few weeks ago, we each had a slice of blueberry loaf cake for breakfast – something that family friends of hers had dropped off earlier that week. And while the cake may have been overshadowed by the beautiful weather and the prospect of going out on the lake, I didn’t forget about it. When I got back home to Buffalo and saw homegrown blueberries appear at the grocery store, I knew it was the absolute first thing I wanted to make. The recipe’s so simple, too. Adapted from this one at All Recipes, it’s a one-bowl masterpiece that takes less than 15 minutes to whip together. 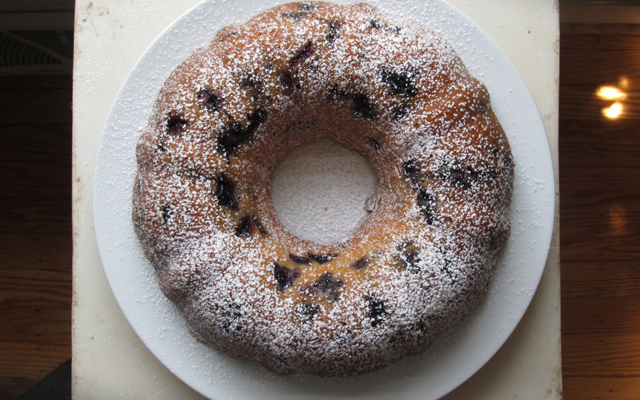 And once it’s done, I like to dust it with just a little bit of powdered sugar and fill the center with the leftover blueberries (a pint yields just a bit too much for the recipe). Expect it to disappear immediately; I made two within one week (and I’m still craving more). Grease and flour a 9-inch bundt pan. Cream together butter & sugar on medium-high in a mixer. Add in eggs, one at a time, on medium. On low speed, mix in the sour cream and vanilla. Separately, combine the sifted flour, baking powder, and salt. With a rubber spatula, fold the flour mixture into the butter mixture until just-combined. 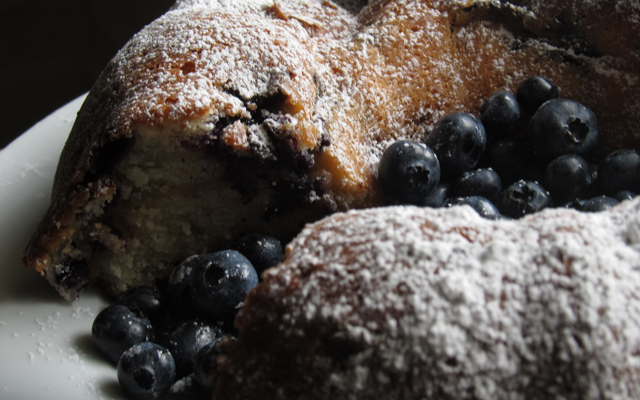 Meanwhile, toss blueberries with a dusting of flour and then fold into batter. Spoon half of the batter into the bundt pan, and then sprinkle a bit of brown sugar, cinnamon, and pecans. Repeat with the rest of the batter & sugar mixture. With a knife, give everything in the pan a few swirls to mix the batter & cinnamon sugar, and then smooth out the top with the spatula. Place in oven and set the timer for 40 minutes. After this point, keep a close eye on the cake for up to 15 more minutes; it’s done when a knife inserted into the cake comes out mostly clean. (The original recipe called for 60 minutes — much too long.) I like to almost under-bake the cake so that it remains soft and succulent for a few days (if it lasts that long)! 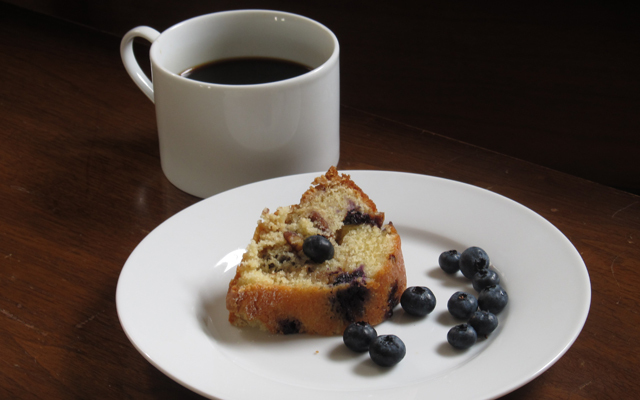 Enjoy with espresso, strong coffee, with extra blueberries, or in a piece of foil on the go: whatever works.